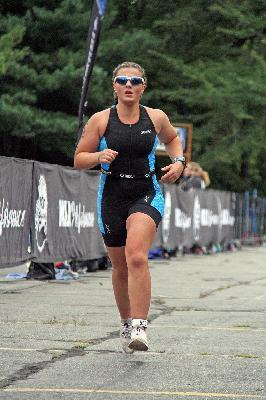 I started to do triathlons when I was 12 years old. I loved it from the very first moment. I came to team practices every single day and did extra on my own. When I was 15 years old, we decided to move from Israel to America because of my mom’s job. I had to leave my team that I loved so much and move to a new place and adjust to the new culture and language. I joined the YMCA swim team for a while, biked in a group that we found in the area and ran in school. I joined the cross country team in my high school and spent the past two years racing in cross country. Even though I joined different groups- a swim team, a bike group and a running team, I always felt that I had to stick with Triathlons. I love the combination of swimming, biking and running all in one race. After every single race I compete, I feel accomplished, proud and happy. In the past four months, I have been training in order to maximize my triathlon performances and be in a triathlon team in college. I am honored to be a part of team USA and continuing my family tradition. My grand grandmother was a swimmer prior to the second world war. She was supposed to participate in the Berlin Olympics but could not, only because of Hitler. She than moved to Israel and owned the award of being the Israeli champion for many years. In addition to her great performances, she also got to participate in the Maccabi games in Israel and even carrie the israeli flag in the opening ceremony. likewise, my aunt used to be a swimmer as well. She owned the award of being the Israeli champion for her age and also participated in the youth Maccabi games in Canada. During the past two Maccabi games in Israel, my older brother got to participate in the Rugby games and even got a silver and bronze medals. Lastly, As a person who lived in Israel her whole life, moving to a different country after 15 years is very different. Being a part of Team USA in the Maccabi games as a triathlete, feels like being at home. The Pan American Maccabi Games are a celebration of Jewish unity, culture, and heritage through athletic competition – I am so honored to be a part of Team USA! I hope you will join me in my fundraising efforts for the 14th Pan American Maccabi Games in Mexico City, Mexico – any contribution helps! Your support will ensure that my team is well represented in Latin America with world-class Athletics and Jewish Pride. You can make a difference! In addition to making a direct donation on this website, you may send a check directly to the Maccabi USA office. Please make sure to put my name in the memo line of the check.